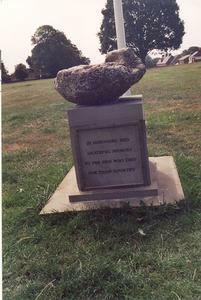 Stone of remembrance surmounting a square plinth and paved base with tablets on the faces of the plinth with the inscriptions in black lettering. 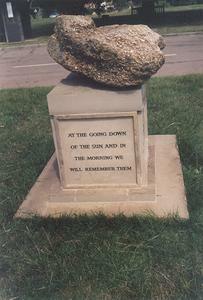 6 o'clock face: IN HONOURED AND/ GRATEFUL MEMORY/ TO THE MEN WHO DIED/ FOR THEIR COUNTRY. 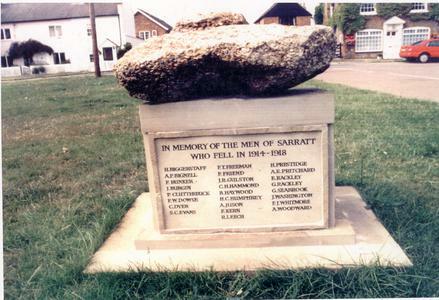 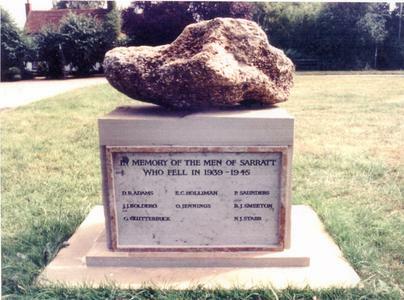 3 o'clock face: IN MEMORY OF THE MEN OF SARRATT/ WHO FELL IN 1939 - 1945/ (Names) 9 o'clock face: IN MEMORY OF THE MEN OF SARRATT/ WHO FELL IN 1914 - 1918/ (Names) 12 o'clock face: AT THE GOING DOWN/ OF THE SUN AND IN/ THE MORNING WE/ WILL REMEMBER THEM.